La Chimere Pousada, Buzios, Brazil details from BrazilBookers.com. La Chimere Beach is located between Ossos beach and Azeda-Azedinha beaches which makes it perfect for beach lovers and relaxation. It’s also close from “Rua Das Pedras” the main street in Buzios which is a market place. There are 26 rooms in the hotel equipped with Air Conditioner, Direct Dial Phone, Safety Vault, Cable TV and Private Bathroom. The hotel also has a Pool, Garden, Bar and WI-FI internet. The restaurant in the hotel provides a Tropical Breakfast Buffet and includes many Brazilian and international Dishes for lunch and dinner. The best part of this hotel is that all most of the beaches are close to the hotel. The Pousada La Chimere enjoys the privilege of being located at 30 meters from the pristine Ossos beach in Buzios. The centre of Armacao Buzios is four kilometers from the resort. Rio de Janeiro is at a distance of 182 kilometers and Sao Paulo is 610 kilometers away. Links to public transport can be found outside the hotel. The Azeda and Azedinha beaches are in the vicinity. The Joao Fernandes Beach is easily accessible from this family-owned resort. A minute’s walk can lead you to the bars and nightclubs where the enthusiastic crowd taps their feet to the beat of rhythmic music. Away from the unwanted noises, the peaceful and tranquil setting of the resort offers a memorable retreat. The unique architecture built in the Buziano style greets the travelers warmly. The two floors of the hotel comprise of 25 suites. The guests can choose from Standard, Superior and Luxury Suites. The décor is a wonderful blend of modern and rustic charm. Hues of bright colors light up the cozy apartments. A cable television, personal safe, a king size bed, direct dial telephone, refrigerator and a mini bar can be enjoyed in the suites. The attached bathroom provides a hair dryer. The Standard Suite overlooks the beautiful courtyard of La Chimere. The Superior Suites occupying 18 square meters face the lush gardens of the resort. The spacious Luxury Suites offer the panoramic view of the Beach of Bones. The room service and the laundry service are available. A computer with internet access is present in the lobby. Some areas of the resort have Wi- Fi connection. With modern conveniences in a friendly surrounding the resort lives up to the expectations of the guests. 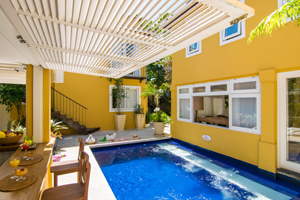 Inside Pousada La Chimere, the attractive tropical courtyard features a swimming pool. In the patio the smart white tables amidst green foliage create a romantic setting. A tropical buffet breakfast is served in this courtyard. A restaurant and a bar are open for the guests during their stay. Some lip smacking Brazilian and international dishes can be relished at the restaurant. Some informal moments can be spent at the café. With drinks and snacks of your choice this cozy place can be fun. Currency exchange facility is available in the hotel. Cars can be parked outside the hotel. A short walk of fifteen minutes takes you to Ruas Das Pedras. The restaurants and the local attractions are worth a visit. The nearby places can be explored with a rented bike. As the magic of Buzios engulfs you this resort in Brazil is sure to win your heart. When would you like to stay at La Chimere Hotel ? 1) Rates at the La Chimere Hotel may not be valid during Carnival, New Years, Easter and other special dates. © Copyright Bookers International, LLC. All Rights Reserved – Information on La Chimere Pousada, Buzios, Brazil details from BrazilBookers.com.